Striking a playful pose with a feline friend, this 5-inch long bisque bathing beauty is part of a scarce series by Galluba and Hofmann of lovely ladies lounging with their pets. Her mohair wig is a replacement, but she retains the remains of her silk net bathing suit with shredded faded red bows at neckline and on back. There are no visible marks. The cute kitten in the blue bow was molded separately and added to his mischievous mistress during the greenware stage. 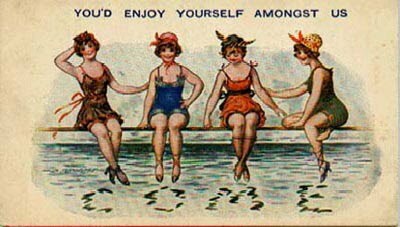 This allowed Galluba to use its existing bathing beauty models and expand its offerings by simply adding an assortment of animal companions. The additions included two different types of cats, a spaniel, a French bulldog, and even a very rare devilish imp. Here is the same model, sans pussycat, who appeared earlier in this blog. 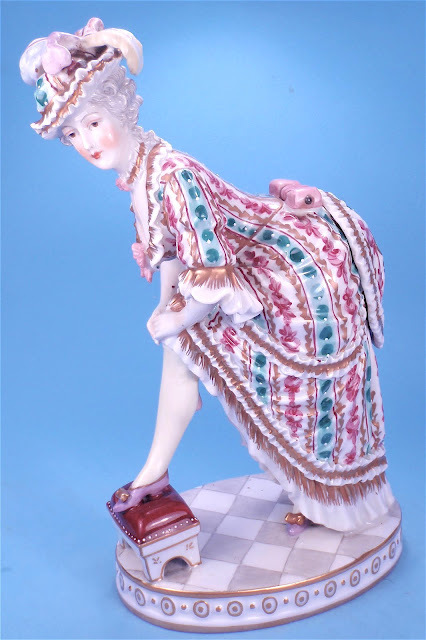 This belle in a bustle by the German firm of Carl Thieme has appeared previously on this blog, but recently I came across what may be the source of inspiration for this gaudily-gowned gal tying her garter. This early French fashion print shows a "Femme en Robe à la Polonaise." This style, with a fitted bodice and the back of the skirt drawn up into swags, was popular in the 1770s and 1780s. Thieme certainly seems to have based his belle on this early print, substituting a footstool for the stone and a tiled floor for the grassy lawn. 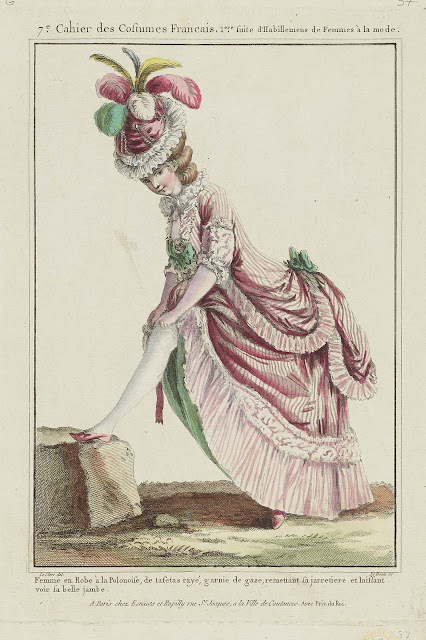 As these prints were made to appeal to wealthy women of fashion, it is unlikely that this lady's pose was originally meant to titillate. It was instead a creative way to show the style of shoes and stockings worn to accessorize this elaborate outfit. 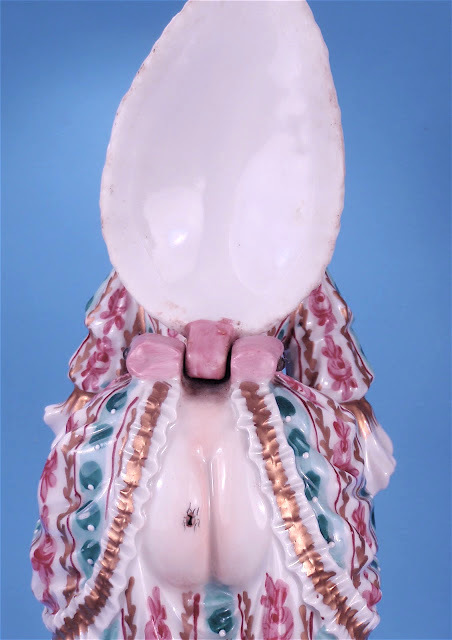 However, when Thieme translated the paper print into porcelain in the late 1800s, the intent was certainly to entice. . . .
. . . . especially as the bustle was hinged to lift up and reveal both the lady's blushing bare buttocks and a rather bold brown beetle.